28,918 backers pledged $2,121,465 to help bring this project to life. There is more to the game than fighting monsters. Build a stronghold, and influence the world. Maybe only one or two players in any group are interested in this sort of thing, but it only takes one character building a stronghold to radically change the nature of a campaign and introduce new narrative opportunities for DM and players alike! Huge new story opportunities arise! This book includes tons of examples for DMs to inspire them. In addition to the pledge level bundles, you will be able to add-on extra goodies in the pledge manager after the Kickstarter! You want two copies of the book, you got it! You want to add the littlest dragon, you got it! Check out the individual prices below. The Kickstarter Exclusive edition will be swanky. Also the shirt will be swanky. The text you see here will only be available for the Kickstarter-exclusive shirt! We'll make more shirts later with different (and no) text, but for the kickstarter, you get the Earth Elemental. This product will not turn your game into a 4X game, or an RTS. It grants new character options and opens the game up to a more political arena where nearby local powers, both good and evil, take an interest in the PCs and what they’re up to. Nor is this product about buying 10’ squares of wall or individual doors. You don’t create a PC by buying organs! Keeps let you raise armies, and the rules include a new, basic version of my forthcoming Warfare rules. Towers let you conduct spell research. Temples let you buff armies and towns. Establishments generate revenue and gather intelligence on your neighbors. Founding a Stronghold enhances one of your class abilities! A Paladin gets an improved Divine Smite, a Bard gets an improved Inspiration. The improvement is temporary through, requiring the character to return home if they want to refresh their cool new ability. Gives PCs a reason to go home! A mercenary company or displaced soldiers from a recently lost battle arrive and pledge service! You’ve got a very tiny army! The book comes with the basic version of my Warfare rules designed to sit on top of normal encounters. Lower-level heroes who pledge service and can be sent out into the world to do your bidding! Includes a Questing system, and optional rules for taking your adventuring followers with you without slowing everything down because you’re running multiple characters. Blacksmiths, farmers, scribes, tailors. All grant you or your stronghold some new ability. And! Many of them can make magic items for you! Bring your scribe the heart of a dragon, and they can make scrolls of protection against dragons! Bring your alchemist the brain of a Mind Flayer, and they can make potions of Mind Flayer control! Your blacksmith (with a wizard’s help) can make Arrows of Slaying! Swords with extra bonuses vs monster types! My group has been using a variation of these rules for over 30 years! An emissary from a nearby Orc tribe arrives to establish an alliance. Now you can buy Orc units! And, of course, an alliance with the Orcs or Elves or Dwarves comes with all sorts of interesting political ramifications. Powerful nearby entities like what you’re doing and want to help. Dragons, Giants, even Demons and Angels depending on your character’s alignment! They’re far too powerful and proud to do your bidding, but they might help out at a critical moment or deliver important news and advice about the greater world and other planes of existence! Plus, players think having a Dragon as an Ally is cooool. It might even let you ride it! I mean, probably not, but maybe! You can download an early version of the Paladin's Follower Chart here! Every stretch goal listed below adds content to the hardcover Strongholds & Followers book at no extra charge. Your $30 pledge just gets you more book, as more people pledge. The first stretch goal is the most exciting. We’re going to add a third category of dragon to the game, the neutral Gemstone Dragons. Five new dragon types, Amethyst, Emerald, Topaz, Sapphire, and Ruby. These dragons focus more on lore, knowledge, magic, and even psionics, than their chromatic or metallic counterparts. Depending on your alignment, and how well you roll on your classes’ Follower Chart, you may end up with a Gemstone Dragon Ally! These dragons get complete write-ups across several age categories so you can also use them as monsters if you so wish. Gemstone Dragons are born as flesh creatures, but grow more crystalline as they age, until the oldest, the Ancients, which are entirely crystal. If we reach this stretch goal, we unlock new pledge options that let you buy one of the five dragon types, or all five! A Topaz Dragon Wyrmling - A wee dragon! Great for an special animal companion. A Young Emerald Dragon - About as big as a horse. An Adult Amethyst Dragon - Big and impressive! An Adult Ruby Dragon (above) - Equally big! Master of mysticism! An Ancient Sapphire Dragon - Even bigger and fully crystalline in form. Note that the minis are normal opaque plastic, just with crystalline shape. ~20 pages of new items, including several codices, tomes of powerful magic that bend reality and grant those who carry them great power. A Wizard who builds a Tower always knows where the nearest codex is, so we need some codices! 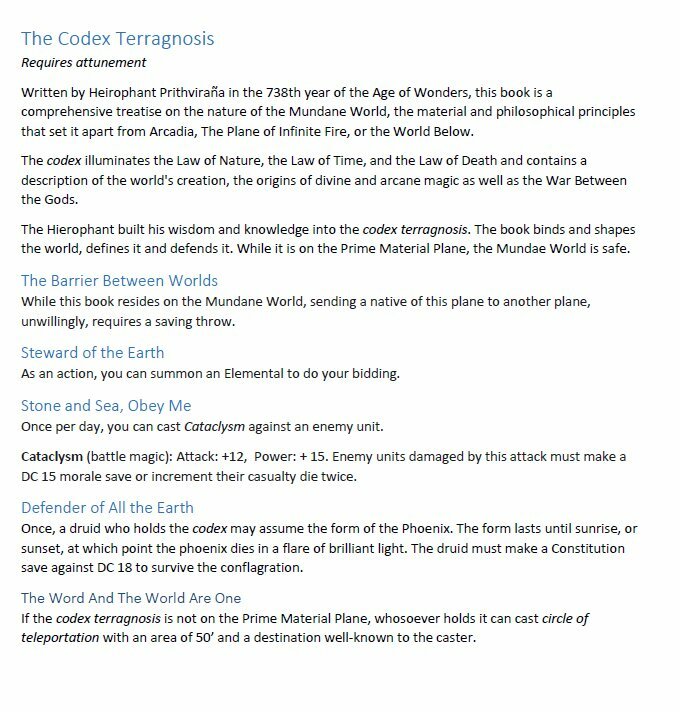 Here's an early draft of the codex terragnosis. Found and used by Salar Bearmantle in my last game! In addition to codices, new items that affect your stronghold, or require being permanently installed in a stronghold are included. Explore the ruins of...either an ancient Keep or an abandoned Wizard’s Tower, I haven’t decided which. Then restore it and make it your base of operations! This adventure presents the clearest, most straightforward way to use this book, it walks both the DM and the players through the process of clearing out an abandoned stronghold, restoring it, and defending it against local enemies. Includes maps of the stronghold, both as a ruin and as a restored base of operations. Certainly the greatest risk is producing minis. Unlike printing books, I’ve never done this before and there will certainly be unforeseen problems. If all else fails, we could 3D print them ourselves, which would be a lot of fun, probably! It’s possible we’ll miss our dates, but backers who pledge enough get access to early playtest materials in PDF form, so even if the book is late, folks will still have the manuscript. People like the logo, so here's a couple of stickers! The classic neon and a Kickstarter exclusive retro-radio version. Strongholds & Followers in an indexed, searchable PDF. The book in hardcover AND the PDF and some stickers! The book will be high-quality paper and binding. All the above PLUS a Kickstarter-exclusive MCDM shirt with "The Earth Elemental Steps On Your Head, To Make Sure You're Dead" printed on the back. The book (and of course the PDF) in a Kickstarter-exclusive, leatherette cover with cloth bookmark and gold trim. It will look swanky. There's no limit, but you will not be able to get this once the kickstarter is over! We are making minis! At this level you get one adult dragon mini. These will be resin or plastic, not clear or transparent. In addition to the book in hardcover (+ PDF + Shirt + Stickers!) You get access to the Playtester discord where you'll be able to read and test early drafts of the rules AND a 1 month subscription to our Twitch Channel should we succeed in streaming our game. All the above, and your hardcover is the Kickstarter-exclusive leatherette version! Which is gonna be SWEET! The dragon mini, the stickers, the shirt, the PDF, and the normal Hardcover of the book. This is the entire set of Kickstarter-exclusive Gemstone dragon minis. One small, one medium, two large, and one huge dragon mini! All the swag: stickers, shirt, PDF, five dragon minis and a SIGNED copy of the Kickstarter Exclusive hardcover!